Yes, I do eat McDonald's from time to time. 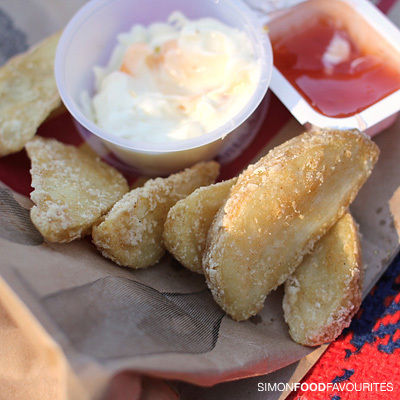 Mostly the occasional hash brown on a road trip or during a lazy weekend grocery shop. 30 cent cone ice creams are popular with the family at the drive-thru or a Big Mac and fries when I'm too drunk to care. Let's move on. 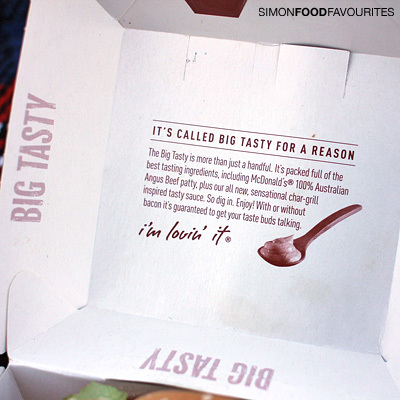 It seems every few months McDonald's introduces a new range of burgers and the latest is their Big Tasty range. 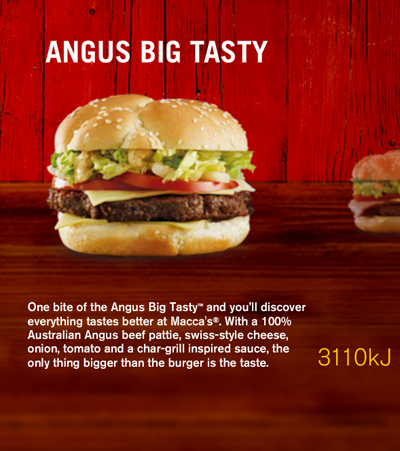 I tried the Angus Big Tasty which is pretty much a Quarter Pounder with the addition of tomato and lettuce and a new tasty sauce on a different style bun. There's a version with bacon but I opted without. I like the bun better than the normal one although I suspect it's the same sugary formula. Out of all the limited edition burgers I've tried this one seems to work the best on taste and combination of flavours for me. 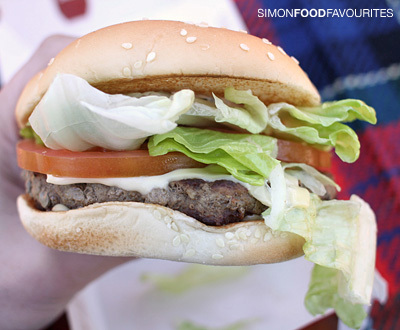 The char-grill inspired tasty sauce sets this burger apart from the rest of the menu like the special sauce does for the Big Mac. If you hate McDonald's and think it's the most evil company in the world then you'll obviously not be trying it. 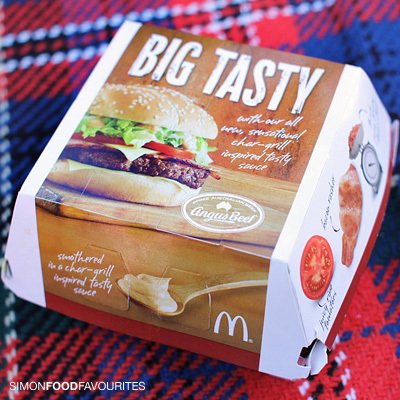 If you like or love McDonald's then I'd love to hear what you think of it if you get to try it. 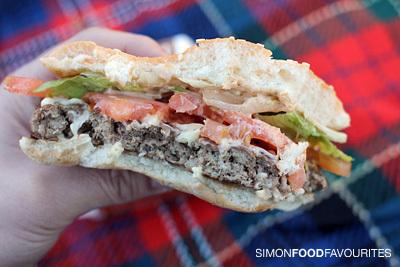 The Big Mac has always been my guilty pleasure but if this was a permanent menu item I'd probably consider this one as well because it has all the ingredients I look for in a burger. 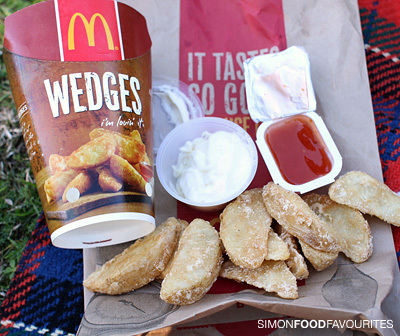 The newly advertised Wedges ($2.95) on the other hand were very disappointing and I'll be avoiding them in the future. Pale in colour and bland in taste they are a far cry from the ones you'd find in any pub cooked to order with much more crisp and flavour in the coating. The pack is small and the wedges are too. 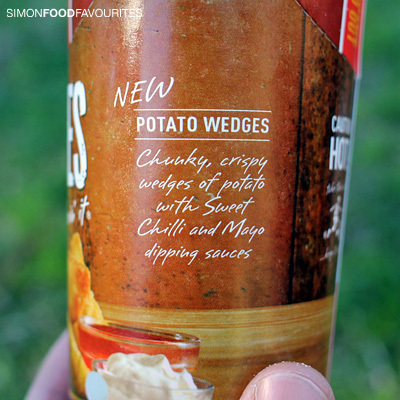 The mayo was OK but the sweet chilli sauce looked very processed and artificial with a Ghostbuster gel consistency. The Fruit Bag ($1.65) is possibly the healthiest single thing on the menu and designed for convenience but the packaging won't be good for the environment. 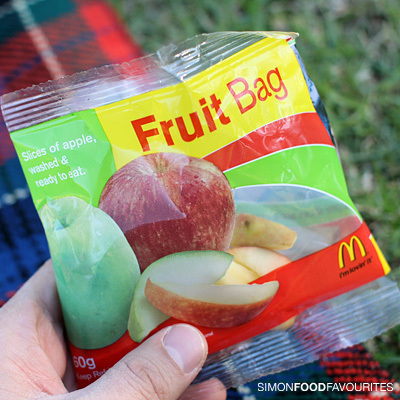 For the price you'd be wiser to buy an apple from a fruit shop but if you haven't prepared and packed one in advance this might be a healthy snack on the go for the kids. 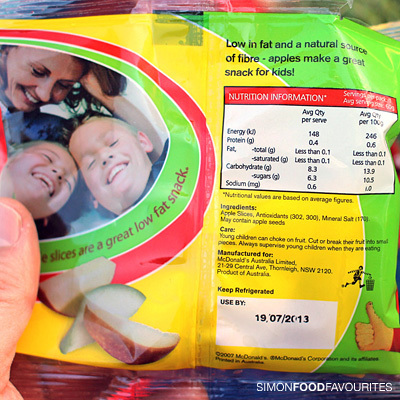 I'm a bit concerned about seeing Antioxidants (302, 300) and Mineral Salt (170) on the ingredients but I assume it's to stop the apple slices from going off and hopefully is harmless. Combination of ingredients works well for me. The sauce makes it all come together. 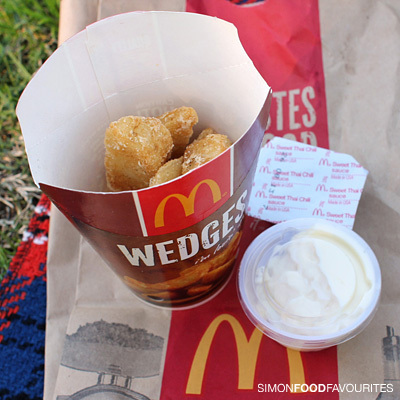 Wedges ($2.95) — pale in colour and bland in taste makes them a fail for me. Head to a pub for the real deal. Fruit Bag ($1.65) — slices of apple, washed and ready to eat. This is why I love reading your blog - because you are prepared to eat anything and anywhere. I'll admit to having a weakness for the McDonalds soft serve cone. Cheap and hits the spot on a hot day. 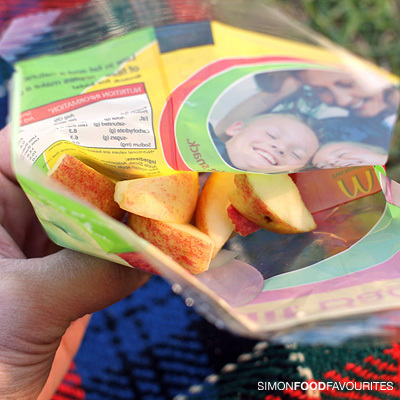 i havent had maccas in almost 3 years now but im tempted to go back just for the despicable me toys! and im not too keen on those apple slices, maybe its because i like biting out of an apple and not sliced fruits. 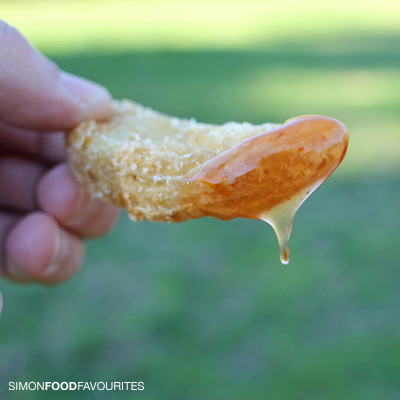 the wedges don't look very appealing :( lol they actually look like fried apple slices! I agree with Vivian, the wedges don't look good at all, but the bun looks quite nice. 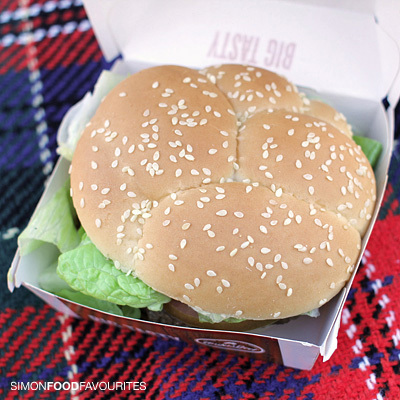 What turns me off McDonalds is the grey colour their burgers seem to have....just looks off to me. hi beryl, i'm glad you're a fan of the macca reviews. i got the despicable me toy as well — for the kid of course. 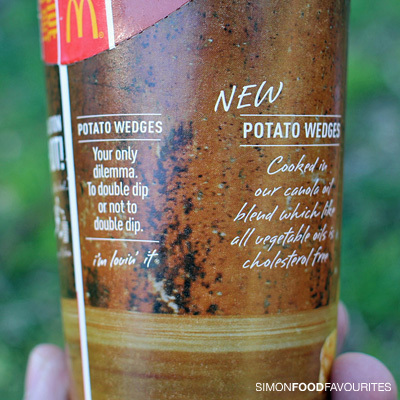 I love that you review maccas. I'm a sucker for a 30c cone! Although I'm quite proud that I haven't eaten a burger from maccas for awhile, even though the maccas at Blaxland is perfectly placed for a break on the way to/from Sydney. hi mary, i think many of us are in the same boat with the temptation of the 30c cone. they pretty much make no money on that item which is a win for us.